Episodic ataxia type 2(EA-2) is a rare, autosomal dominantdisorder characterised by recurrentepisodes of ataxia and dysarthria,due to mutations in the CACNA1A gene on chromosome 19encoding voltage-dependent Ca2+channels. 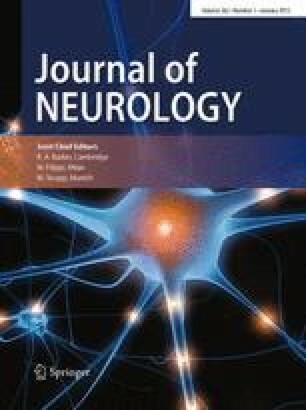 The aim of the presentstudy was to explore whether axonalmembrane properties, assessedusing nerve excitability techniques, were abnormal in patients with EA-2 . Nerve excitability techniqueswere applied to the median nerveof three individuals from threegenerations of a single family, all ofwhom had typical features of EA-2. This family was found to have anovel mutation at codon 1451 ofthe Ca2+ channel alpha 1A subunit.Nerve excitability testing demonstratedsignificant abnormalities,with all patients outside the normal95 % confidence limits in having ahigh rheobase and reduced earlyhyperpolarizing threshold electrotonus. On average there were alsosignificant reductions in refractoriness,late subexcitability and earlydepolarizing threshold electrotonus.Mathematical modelling indicatedthat a similar pattern of abnormalitiesmay result from areduced voltage dependence ofslow K+ channels (KCNQ channels). There are significant and distinctivechanges in peripheralnerve excitability in EA-2 patients,which are presumably induced indirectly. These findings raise thepossibility that excitability testingmay prove a convenient screeningtest for patients with this suspectedchannelopathy.